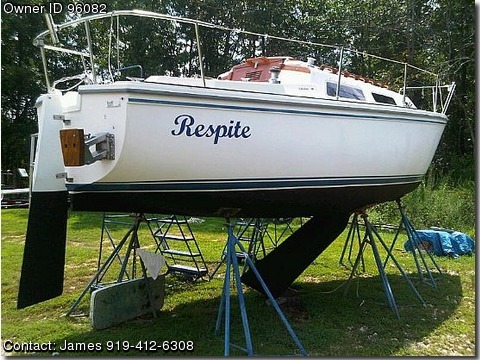 Call Boat owner James 919-412-6308. Well maintained 1985 Catalina 25, swing keel sailboat Includes 9.8HP Nissan outboard and gas can, spring assisted motor mount, Mainsail, Genoa, Working Jib, Battery Charger, Bimini, Anchor, Fenders, Two Self-Tailing winches, lines, swimming ladder and more. Pop-top main cabin provides standing head room. Full-surround canvas curtain/enclosure with windows included to stay dry with pop top open in rain storm. Cabin is equipped with lights. Includes Port-a-Potty with privacy curtain. Set up for Air Conditioning with portable A/C unit (included) that sits in between the pop top. Completely overhauled in 2010 Exterior wood trim, tiller and companionway panels varnished Boat bottom painted New battery New Garmin Marine GPS /depth finder/chartplotter with Lake map New VHF Marine radio Outboard engine serviced in 2012 --oil changed, cleaned out Galley Built in Ice Box Single Burner alcohol stove SS Sink Head Vanity with stainless steel sink and mirror Storage below vanity Removable Port-a-Potty V berth Large overhead opening hatch Lighting Storage below Located on Kerr Lake near Henderson, NC.